There were lots to see and do for everyone. We had a wonderful May Fayre again this year with many people attending. We were very fortunate with the weather to begin with and it was just a joy seeing everyone so busy setting up the stalls and helping to get everything ready for the big start at 11am. Hence, it all began with prayers before people were able to look around and start to spend their money. Around about lunch time the weather closed in somewhat and we had rain, fortunately the rain was quite gentle so people were still able to mill around enjoying the different games and entertainments’. 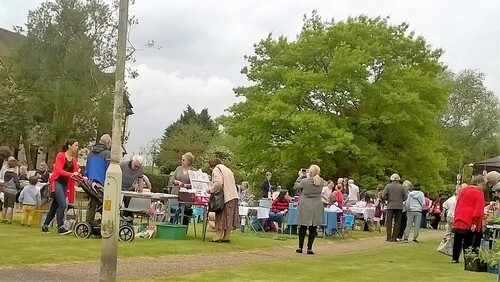 Many people were enjoying the BBQ, popcorn and candyfloss treats, while others sought the comfort of St Leonard’s Hall to partake of tea, coffee and cake… We had an amazing raffle, with hampers, boxes and bags of goodies, and another raffle for vouchers donated by local businesses. We had a stall set up to advertise and collect for Christian Aid, while Michael and Claire spoke about and took charge of little Isabella’s ‘Wish to Walk’ collection. Broomfield’s Got Talent produced some great acts, which included singers, dancers and performers, all of whom received a warm welcome and appreciation… especially the final act which was a bit of a surprise dance routine performed by Revd’s Carolyn and Julie. Wow! The fayre closed just a little early as the rain persisted, but not before the amazing raffles had been called and Revd Carolyn had presented prizes to the ‘Broomfield’s Got Talent’ performers. Carolyn thanked everyone for all they had done especially those who provided refreshments in St Leonard’s Hall, and all the sponsorship gifts from local businesses that together, helped make the May Fayre 2018 so successful despite the weather. Revd Carolyn presented flowers of gratitude to Sarah, Rachel and Sue Browning for all their hard work organising this huge event and also thanked those who help set up and would help clear away after. It was announced in church this morning (13th May) that the Fayre had raised in excess of £2,000 with monies pending – Many Thanks to all.